Ben’s is a place for big family get together or even a relaxed weekend brunch. I find that this place is surely the perfect gateway for any occasion for friends and families to enjoy themselves just as they would at home. Their service is very nice and pleasant looking staff here . The decoration is very spaciously modern, industrial chic interior that can seat up to 50 peoples. Feel comfortable while dining at there and enjoying a cuppa and desserts as well. Majority of the food here are western food and some local choices of food are available too. For the mains, I prefer the pasta of this seafood spaghetti cooked with basil, parsley, parmesan, pine nuts, lemon rind and garlic. The seafood is plentiful and the squid tasted ocean-fresh, tender and juicy .The pasta actually tasted like real like a home cooked food that is perfectly done and not too dry. These pasta dishes are sure to impress. Wonderful flavor! Recommended for this mouth watering pasta for dinner or lunch. Walnut brownie which is my all time favourite when dining in Ben’s outlet. I like the most is the chocolate taste of this signature bens cake. Surely the best pick if you are a chocolate lover as this pieces of the cake is very huge and spread with so thick layer of the chocolate. Gooey chocolate fudge cakes that can satisfy your chocolate craving. 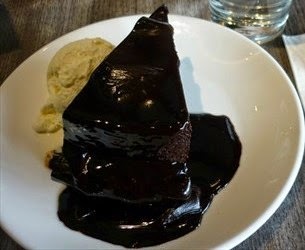 The texture is moist and rich with chocolates served with a scoop of vanilla ice cream. I can’t stop myself alongside scoops of the warm brownies intermittently. Addictive and heavenly chocolate cake. For another desserts choices, I opt for Lemon cake with lemon cream cheese frosting. It was so delicious and appetizing. This attractive layer cake tastes so good. The cake glaze have a mild lemon flavor that's delightful to paired with a cup of hot warm coffee. The texture of the cake is light, soft and fluffy. Take a bite and taste the burst flavours from the creamy lemon filling that is so aromatic and purely lemon flavour. I love to visit here always because of their good and friendly customer service and dining in a very cozy ambiance. Jalan Maarof, 59100, Kuala Lumpur.